Eight people were arrested on Sept. 28 as unrest continued in the St. Louis suburb of Ferguson. 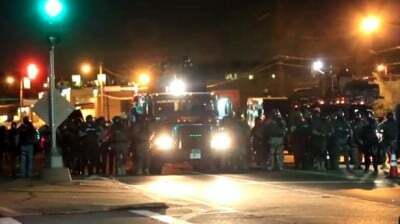 People reportedly threw rocks and bottles at police during the evening amid escalating tensions over the failure of a Missouri state grand jury to file charges against white police officer Darren Wilson in the shooting death of an African American youth on Aug. 9. Just five days before demonstrations flared again on Sept. 23 when one of the people’s memorials to slain 18-year-old Michael Brown was destroyed by fire. Crowds quickly gathered at the scene prompting a police response that later sparked a small-scale rebellion. Windows were broken and several fires were set in protest. The incident thrust Ferguson, a town of 21,000 people, the majority of whom are African American, back into the national and international spotlight. Subsequently on Thurs. evening Sept. 25 another demonstration was held outside the police headquarters in Ferguson. Earlier that day, the police chief Tom Jackson issued a belated apology to the family of Michel Brown as well as members of the public who felt they were mistreated by law-enforcement in the days following the killing. During the protest outside police headquarters Jackson attempted to march alongside the crowd which was demanding his resignation. Soon a scuffle erupted with police resulting in further arrests. On Sat. evening Sept. 27 a Ferguson police officer was reportedly shot in the arm by an unknown assailant. The authorities were quick to claim that the wounding of the cop had nothing to do with the mass demonstrations and rebellion that has been ongoing for nearly two months. An extensive hunt for the gunman was undertaken. Press reports indicated that the wound was not life-threatening and the officer was treated at a local hospital and released on the same day. Since there was no video documentation of the incident and no eyewitnesses have been reported, it will remain to be seen what the actual circumstances were involving this shooting. There have been previous reports of police being fired on since the beginning of the mass demonstrations and rebellions which erupted after the death of Michael Brown. Support among some within the white community, including the police department which is overwhelmingly Euro-American, is strong for not charging or prosecuting Wilson. Demonstrations have been held in St. Louis County in defense of Wilson and a bracelet saying “I am Darren Wilson” has been seen on the wrists of police officers. The United States Justice Department is currently in Ferguson investigating civil rights issues related to the shooting of Brown. Two letters from an investigator urged police officials to prohibit their personnel from wearing the bracelets while on duty patrolling the majority African American community and to always make their name plates visible to civilians. Nonetheless, the people of Ferguson are determined to win some semblance of justice for Michael Brown. Demonstrations are continuing with the specific demand that Wilson be indicted and that reforms be instituted involving police-community relations. During Oct. 9-13 a series of demonstrations are planned that will attract people from throughout the country. The unrest in Ferguson further exposed the continuing national oppression and state repression so prevalent in the U.S. Although President Barack Obama was forced to mention the disturbances in Ferguson before the General Assembly within the context of his main goal of prompting yet another imperialist war in the Middle East, neither his administration or the Congress provide any programs and policies aimed at eradicating racism and economic exploitation. Unemployment and poverty remain disproportionately high within African American communities throughout the U.S.
Any real program of action for the elimination of national oppression must emerge from the mass struggles in Ferguson and other municipalities across the country. The organization and mobilization of the masses provides the only real solution to the escalating repressive and exploitative capitalist system.